Israel discriminates in favour of Christians! This latest move by the Knesset, initiated by coalition chairman MK Yariv Levin, appears to be an attempt to divide the Palestinian population! The actual changes enacted by the new law are only minor but their ramifications could be huge. The law increases Christian representation on the advisory committee appointed under the ‘Equal Employment Opportunities Law’ from five to ten persons. The new law thus seems inoffensive in itself, but critics see it as part of a larger strategy to integrate Christians more into Israeli society and so divide them from their Arab sisters and brothers. The truth is, of course, that Christian Arabs are Arabs, and Christian Palestinians have suffered alongside their Islamic Palestinian sisters and brothers since ‘Al Nakba’ of 1948. From my perspective, Levin’s new law might be trying to accomplish more than simply ‘divide and conquer’. It may also be an attempt to win back diminishing support from Christians in the West, particularly from the USA where right-wing Evangelicals have always been amongst the Jewish state’s most unquestioning supporters. Whatever the grand plan, it is quite possible that it could all backfire. What if Palestinian Christians unite in their opposition to the new law – refusing to accept any special privileges above Muslim Palestinians? This could be a powerful witness for the church in Israel/Palestine as well as a serious setback for the Zionist agenda! On Monday, February 23, 2014, the Israeli Knesset enacted a new law that recognizes Muslim and Christian Arab communities as separate identities, giving them their own representation in an employment commission. The law passed by a margin of 31 to 6. The new law passed by the Knesset favoring Christians is, to say the least, a deceitful political stunt by Likud-Beiteinu members aimed at sowing seeds of division among Christians and between Christians and Muslims. For the last sixty-five years, the government of Israel has not shown favoritism or bias towards the Christian community of the land, so why now? During the Nakba of 1948, the Christians, like the Muslims, were dispossessed by the Zionists and were forced out of their homeland. Furthermore, during the military rule imposed by Israel on all Palestinians who stayed inside the Israeli state (1948-1966), Israel did not show favoritism to Christians over Muslims. Both were discriminated against and both were treated as unwanted aliens in their own land. There is a plethora of documentation to substantiate the history of that period. The problem for Israel in those days was not the Palestinians’ religious affiliation but their Palestinian national identity. I believe that the new law reflects the moral bankruptcy of the government of Israel. Indeed, it must be in trouble to allow itself to stoop so low as to blatantly use this tactic to attempt to win the support of some Christians abroad, and, at the same time, sow dissent among Christians and Muslims. It is the old adage of “divide and rule.” This law is sinister in that it exploits the sensitive tensions among the religious communities of the Middle East, especially in light of what has been happening in Egypt and now is happening in Syria. I am certain that the Palestinian community is mature enough not to fall into such a despicable religious trap. There is another dishonest and hidden angle to this law. Jewish religious tradition has always considered Christianity, not Islam, as the mortal enemy of Jews and Judaism. This is due to the fact that the Christian faith came out of the same foundation as the Jewish faith, namely, the Hebrew Scriptures, i.e. the Christian Old Testament. I still remember the Israeli religious establishment discouraging Jewish students from visiting Christian churches while encouraging them to visit Muslim mosques. The advisory pointed out that there was greater affinity between Judaism and Islam, while the gap was quite wide between Judaism and Christianity. What has caused this sudden infatuation with Palestinian Christians to merit new legislation? Or is it just an ugly political stunt? What favors can the right-wing Israeli government give the Palestinian Arab Christians who are Israeli citizens? Will it restore their confiscated land to them? Will it grant them equality with their fellow Jewish citizens? Or are we witnessing another divisive Israeli ploy similar to when Israel set the Druze community apart from its Arab base? It is worth mentioning that over sixty years ago, Israel managed to make the Druze religion a separate ethnic entity, thus separating them from their Arab roots. Through this new legislation, Israel wants to make the Christian religion a separate ethnic identity in order to separate them from their Arab Palestinian roots. But in spite of what Israel has done to the Druze community, an increasing number of young Druze men have been resisting imposed Israeli military service. Israel has been very shrewd in concocting devious ways and means to impose its will on the Palestinians and keep them weak and divided. It continues to connive ways to limit and even deprive them of their rights to the land so they will give up and leave. I am certain that the Christian community in Israel will see through this new Israeli legislation, will expose its sinister nature, and reject it. It is my hope also that our people’s resilience and maturity will foil the Israeli government’s insidious objectives. This we can do through our unity and solidarity, as well as through our determination to continue to work for a just peace, inclusive democracy, and human dignity for all the people of our land. The Rev. 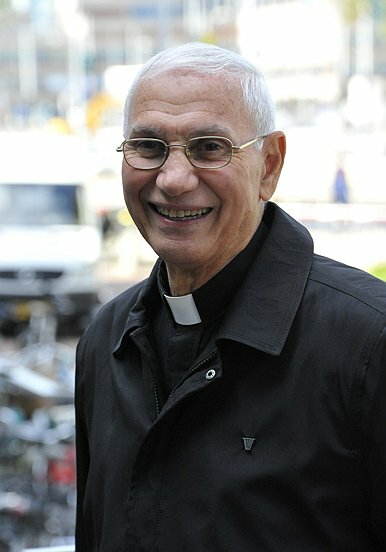 Dr. Naim Stifan Ateek (Arabic: نعيم عتيق‎, Na’īm ’Ateeq) (born in the Palestinian village of Beisan in 1937) is a Palestinian priest in the Anglican Church and founder of the Sabeel Ecumenical Liberation Theology Center in Jerusalem. He has been an active leader in the shaping of the Palestinian liberation theology. He was the first to articulate a Palestinian theology of liberation in his book, Justice, and only Justice, a Palestinian Theology of Liberation, published by Orbis in 1989, and based on his dissertation for his degree in theology. The book laid the foundation of a theology that addresses the conflict over Palestine and explores the political as well as the religious, biblical, and theological dimensions. A former Canon of St. George’s Cathedral, Jerusalem, he lectures widely both at home and abroad. His latest book, A Palestinian Christian Cry for Reconciliation, was published by Orbis in 2008. Tags: Christian Palestinians, father dave, Islamic Palestinian, israel palestine, Muslim Palestinians, palestinian christians. Filed under israel and palestine religious conflict by Father Dave on Mar 7th, 2014. Comment.